The transmitter's signal is not only transmitted to the direct path but to all directions. This will cause the walls, floors and ceilings to reflect the sound, and the reflected signal will overlap with the signal sent directly. For single-antenna receivers, so-called non-diversity systems, the direct and reflected signals it receives usually cancel each other out, resulting in missed sounds. Diversity receivers with two antennas are better able to cope with long distance and channel-intensive applications. Reliable signal setting even in situations where the receiver and transmitter can not be direct. The receiver is not only disturbed by the source of the external radio frequency. So, if possible, keep the receiver away from CD / DAT / MD players, computers / laptops, and special effects devices for just a few feet (or even a few seats). Ideally, the antenna should be placed above the viewer or other obstacle, allowing the transmitter and receiver to "see" each other. If the receiver is mounted in a rack, the antenna must be on the front panel or protrude from the top of the rack. Diversity receiver antenna should be 45 degrees, so that the maximum antenna tip distance. To get the best diversity effect, the antenna spacing should be up to 40 cm (one wavelength), less than this distance will affect the effect. If you need to use multiple wireless microphone systems simultaneously and need to move from one location to another, it is more convenient to install the receiver in a rack. But this will degrade the performance of the wireless microphone system because the antennas are too close to each other. 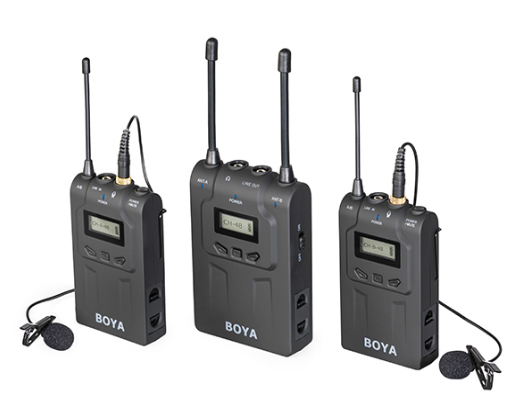 The BOYA BY-WM8 Dual-Channel UHF wireless system is a portable, camera-mountable wireless system for capturing audio with dual subjects. It can be used in several environments for video, field recording, interview, broadcast TV, and ENG applications. More advanced wireless microphone systems use detachable antennas so antenna receivers can be used. The splitter serves all receivers by providing signals to a pair of "primary" antennas, improving the reliability of the radio frequency. If four or more receivers are installed in the rack at a time, we recommend using an antenna splitter to dramatically improve performance. Wireless microphone are also subject to interference from other sources on the same spectrum. The most common is usually television stations, FCC rules require wireless microphone users in the same geographical area to avoid the frequency of use of radio and television stations.